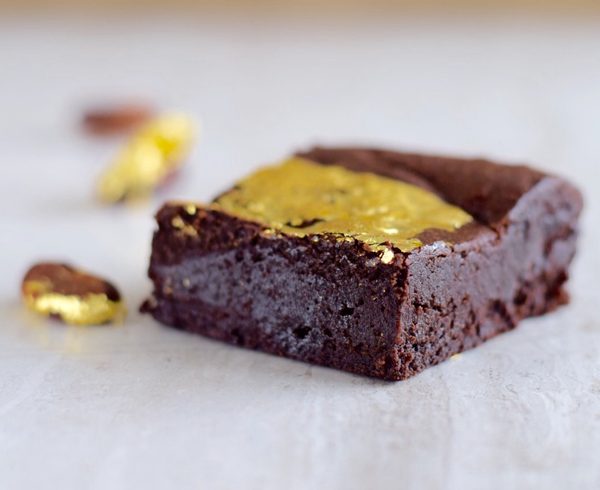 The Goldie – a glittering gold, dark chocolate brownie, hand gilded with edible 23ct gold leaf. Baked with single origin Madagascan chocolate, with cocoa harvested in the tropical forests of Sambirano, Madagascar. A glittering gold, dark chocolate brownie, hand finished with edible 23ct gold leaf. Baked with single origin Madagascan chocolate, with cocoa harvested in the tropical forests of Sambirano, Madagascar. 500g. Unrefined soft brown sugar, unsalted butter (milk), eggs Madagascan cocoa mass (17%), cocoa powder (5%), gluten free plain flour (rice, potato, tapioca, maize, buckwheat), sugar, cocoa butter, Guerande sea salt, E175; genuine 23ct gold colourant, emulsifier: soya lecithin. May contain nut traces. All brownie are made to a gluten free recipe but baked in a kitchen that handles nuts, sesame and wheat. Storage and shelf life. Once opened store in an air tight container and eat by the date stated. Minimum weight. 500g.